You will probably need to give dahlias, salvias and cannas grown in the greenhouse or frames a little longer because they are more susceptible to the cold. 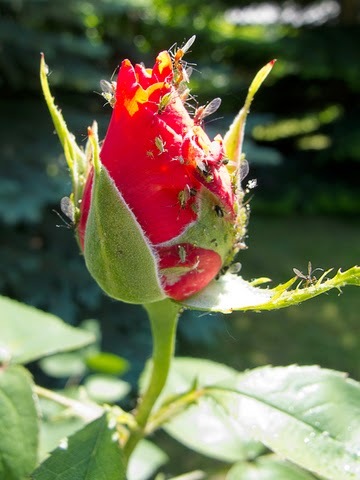 Give roses an early spraying to prevent blackspot and watch out for greenfly. As fast as plants are growing so are the weeds and if you’re planting up borders later in the month you need to get weeding. By mid May you should be clearing the ground and lifting spring bulbs. Don’t cut the leaves off daffodils, hyacinths and tulips, heel the bulbs into a trench, cover with soil and let them gain strength for another year. Plant out early flowering chrysanthemums, hardy perennials and alpines grown in a frame or greenhouse. By late May you can be planting out your hardened-off summer bedding and planting up containers, hanging baskets and window boxes with subtle summer shades or riots of colour from trailing lobelia, pelargoniums, fuchsias, petunias, campanula or whatever takes your fancy. Shade the greenhouse and frames in hot weather.